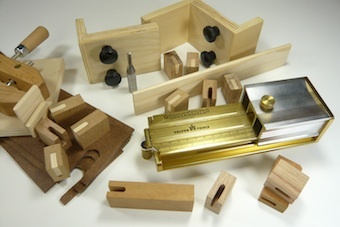 For smaller projects, such as frame and panel construction, picture frames and box lids for example, the open mortise and floating tenon is an appealing option. Not only is it extremely easy to execute – even in comparison to biscuit or domino joinery -, but it also offers a decorative option by making the tenons visible. This joint is intriguing to the observer and looks a lot more complicated than it is in reality to make, while it also offers a lot of strength to the joint. 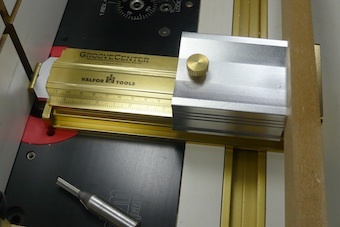 And the GrooveCenter makes life really easy in the one critical step of centering the router bit on the work pieces. 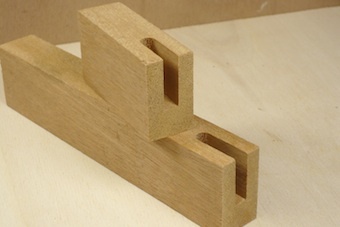 Open mortise joinery with floating tenons is a lot easier than the traditional mortise-and-tenon technique.With the same wood it is almost invisible. Executed with a contrasting wood it can be a nice decorative element in a project. Open mortises are made on the router table. The procedure requires a single set up of a straight bit for both rail and stile mortising (but more of this later!). 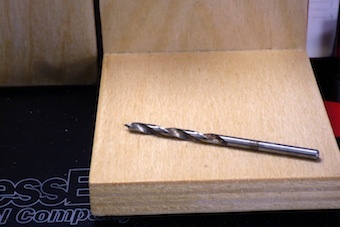 For the operation to be successful, it is essential that the router bit be centered very precisely on the work piece in order for the visible tenons at each corner to be exactly in line. Worse, because each joint is routed from opposite faces, any deviation would be doubled! The GrooveCenter makes easy work of the set up procedure for a spot-on result every time, completely eliminating the guesswork of finding that centerline. As always with the GrooveCenter, no test cuts need to be made to position the router fence for a perfectly centered mortise. 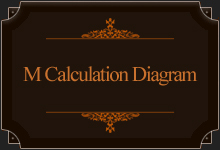 The GrooveCenter does this automatically, flawlessly and without any measuring (more here). For a smooth cut it’s best to set the bit height at the desired final cutting depth right from the start. 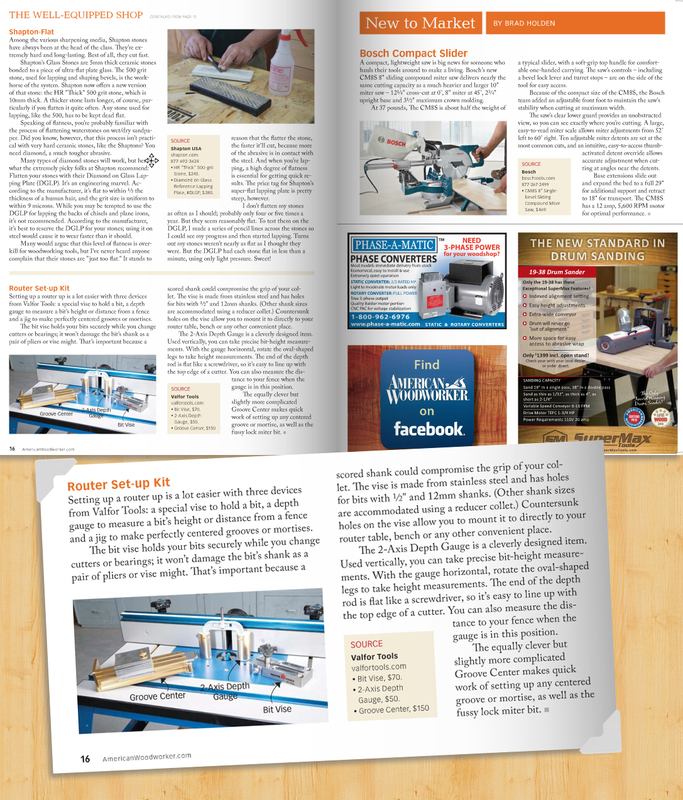 This avoids having to crank up the router several times for each cut. Since this is invariably too deep for a single pass, it’s a good idea to stack up a few spacers and make the cut in several passes. 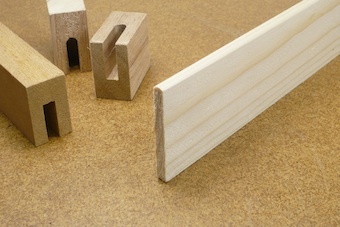 The spacers (in this case 3 layers of hardboard) are wedged in between the stop block and a notched block at the table edge. 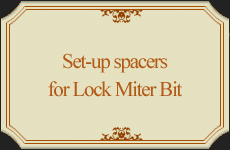 The latter prevents any play of the spacers when pulling the work piece back after each pass, while also allowing their safe removal from around the spinning router bit. It’s a good idea to mark where the cut is going to be made, to eliminate any confusion about the orientation of the work piece. 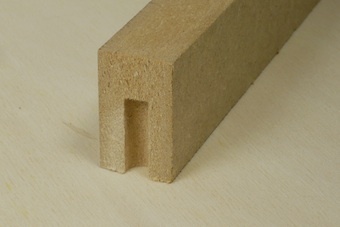 The rail is routed with its outside edge facing down, the stile with its outside edge facing up. The length of the cut is identical to its depth and is marked by a stop block. A good way to find the correct position of the stop block is to score the rail and use the mark as a reference.This cut should be done very carefully. All that is needed is a very light cut, just enough to mark the depth of cut. 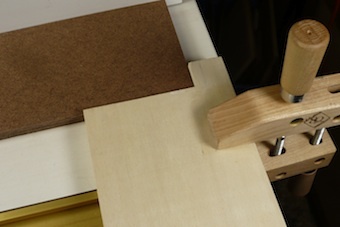 With the rail in a vertical position, “hook” the pocket over the tip of the router bit to set the stop block against the bottom edge of the rail. The line drawn acts as a visual health check. Thanks to the GrooveCenter‘s flawless set up of the fence, this is the result. Perfectly centered and perfectly aligned! 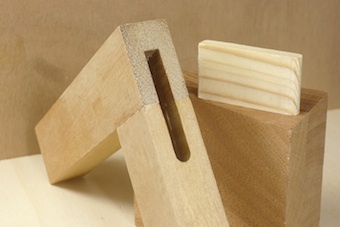 It is a good idea to leave the tenon a bit wide, so that it can be trimmed flush after the glue has dried. 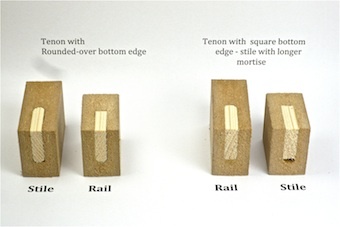 When making the tenons, there is one more issue to consider. Because each mortise half is routed from a different angle, the bottom of the complete mortise is partly flat and partly concave. 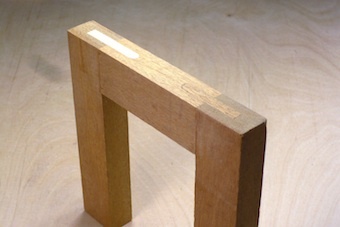 The result is that the tenon doesn’t seat over the full length of the mortise. Rounding over the tenon’s long edge solves this, but requires going back to the router table each time a tenon is cut off from its blank. 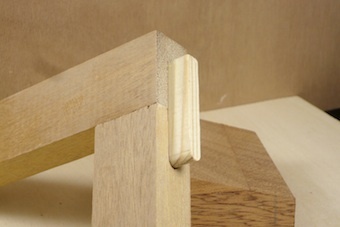 An easier and quicker solution is to make the mortise in the stile slightly longer. 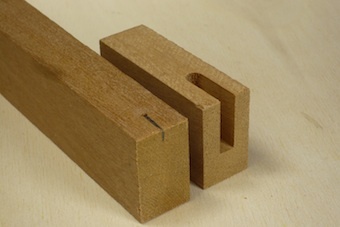 This is a demonstration of either method: on the left, the rounded tenon, on the right, the longer mortise in the stile. 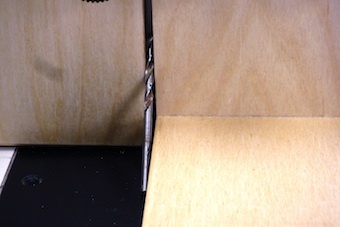 The latter option just requires increasing the length of the original cut by an amount equal to the radius of the router bit used for the mortise.In case of a ¼” mortise, the stop block should be moved away by 1/8”. 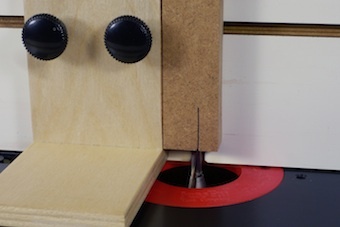 This is easy with an ancillary stop block using a 1/8” spacer (for example a 1/8” drill bit). Once this second stop block is secured, the spacer is removed and the main stop block is moved to close the gap.Now the stiles can be routed in exactly the same way as described above. Making the tenons, the important thing to remember is the grain direction. 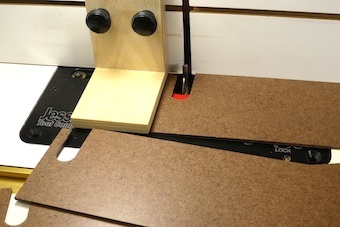 Using an oversized blank is better for a safe roundover on the router table and leaves room to cut off any blowout.Once the stock has been brought to thickness, the end grain can be rounded over and cut to exact length.Most mortises will be done with a ¼” router bit, so while making a blank for the tenons it’s a good idea to save some for future projects! Here is the final result, with two different tenons, showing one with the same wood species, the other in a contrasting wood. The GrooveCenter again as star of the show! The set up was done in less than five minutes. The mortises are super-precise and impeccably centered. And all without any measuring or any test cuts.